alison*elle | Vancouver fashion, beauty, and lifestyle blog: What's In My Hiking Backpack? 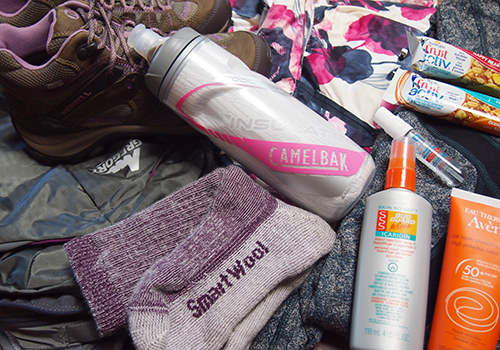 What's In My Hiking Backpack? I've done a few "what's in my bag?" posts in the past (see, for example, work bag, makeup bag, and beach bag #1 and #2). Today I thought I'd do something a little different... a what's in my bag -- hiking edition! If you follow my Instagram, you may have noticed that I've been going on a lot more hikes than usual this summer. Living in Vancouver, with mountains and lakes just a short drive away, it's a common weekend activity for many of us locals to get outside and experience all that this gorgeous province has to offer. I'll also admit that the previous statement is particularly hilarious coming from me because only a few years ago I was so not a nature person. In fact, long time readers of my blog may remember my attempt at roughing it on an Oregon camping trip and this easy nature walk in Whistler that I likened to a grueling hike. Funny how things change! Since I like to be dressed specifically for whatever activity I'm doing, I picked up the Gregory Maya 10 Daypack from MEC in the Fog Grey combo. You can see I kind of have a pink/purple theme going with my gear, haha. This pack is a really good size for day hikes and fits everything I need. SNACKS. Since I'm allergic to nuts, my HG nut-free bars are these Sunrype Okanagan Energy Bars, but I also like Sunrype's FruitActiv bars (though they have less protein). Other favourite snacks to take on hikes include beef jerky and dried fruit. If it's a longer hike, then I'll bring some sort of sandwich. WATER. Staying hydrated is a necessity and I typically bring at least 2 bottles of water. My Camelbak bottle is insulated to keep its contents cold. HAND SANITIZER. Touching dirt, rocks, or trees is inevitable so a hand sanitizer is key when it's time to sit down for a food break. This mini X3 Clean Hand Sanitizer is a spray for easy application and is also alcohol-free so it's not drying. BUG SPRAY. This AVON Skin-So-Soft Bug Guard Plus Icaridin Insect Repellent Spray II is great for keeping mosquitoes at bay. Plus it actually smells pretty good, unlike most other bug sprays. Someone on my last hike likened it to coconut curry! SUNSCREEN. I did a full rundown of my current sunscreens in this recent post. EXTRA LAYERS/RAIN JACKET. Temperatures and weather can change in an instant, plus it's often colder at the top of a mountain. Pretty much all my workout clothing is from Lululemon and my hiking layers are no exception. EXTRA SOCKS. You never know if you'll end up needing to walk through water (been there, done that). Wool hiking socks are my absolute faves, especially the ones made by Wigwam and SmartWool. We are definitely lucky living here. So glad I finally came around to enjoying nature, haha.